Meet the Ares Ranger belt. 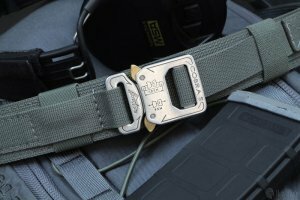 It’s considered the original and best by many when it comes to a purpose built tactical/riggers belt. People often drop a lot of money into their gun and holster only to cheap out on a belt. For some it’s not intentional–they just don’t know. For year’s I’ve used purpose built leather belts as the base of my gun carrying platform. However, as my training has gone no to include situations beyond EDC, I’ve had to add to my gear selection. I first came across the Ares Ranger belt after purchasing a Raven Concealment kydex holster. Many of you have heard us and some of our guests rave about these holsters. Raven Concealment often features their holsters firmly attached to a Ranger belt. And it’s the one they recommended when I asked what belt I should add to my gear. Now this isn’t what I would use as an EDC belt–that’ll come next week. But if you are suiting up for a serious environment, a ranger belt is the ticket.